Experiencing just a few of the low thyroid symptoms listed below can make your life a living hell… Weight gain or inability to lose weight… A slow metabolism… Food cravings and night-time hunger… Sleeping problems… Constant fatigue… Mind fog… And many more. If you have to add the lack of understanding of these debilitating hypothyroidism symptoms from your family and friends (and even from your family doctor), your frustration is completely justified. But you are not a victim; there are ways you can deal with this on your own, you’ll see. With up to 300 million people suffering from an underactive thyroid all over the world (according to Thyroid Federation International), and mounting scientific research linking low thyroid levels to stubborn weight loss resistance and countless other serious health conditions, you’d expect more awareness from the medical community around this “invisible” or “silent” illness, right? The real bummer is that most of your low thyroid symptoms could be unrecognized if your doctor assumes that the debilitating symptoms you’re describing are merely effects of a sedentary lifestyle or advancing age. You’d be shocked… did you know that hypothyroidism is frequently misdiagnosed as high stress? While – along with many other causes – chronic stress can trigger low thyroid levels by weakening your immune system and causing a plethora of hormonal imbalances in your body, going on anti-anxiety medication isn’t going to solve your low thyroid symptoms. Nor is it going to address your very slow metabolism and your inability of losing weight with hypothyroidism. I’m not going to get all scientific on you now… You should only know this. A butterfly-shaped gland located in the center of the neck, your thyroid produces two vital metabolism-regulating hormones: triiodothyronine (T3) and thyroxine (T4), both controlled by your pituitary gland through the thyroid-stimulating hormone (TSH). This hormonal trio is – not surprisingly – much easier thrown out of balance in women, since we have a much more complex and delicate endocrine system than men. In fact, ten times more women than men have an underactive thyroid; it typically starts between the age of 40 to 50, along with the other hormonal changes occurring at this stage in women’s life. However, since water fluoridation has became widespread in most parts of the world, more and more women start experiencing the three most common hypothyroid symptoms (weight gain, fatigue/depression and constipation) in their 30’s and even 20’s. 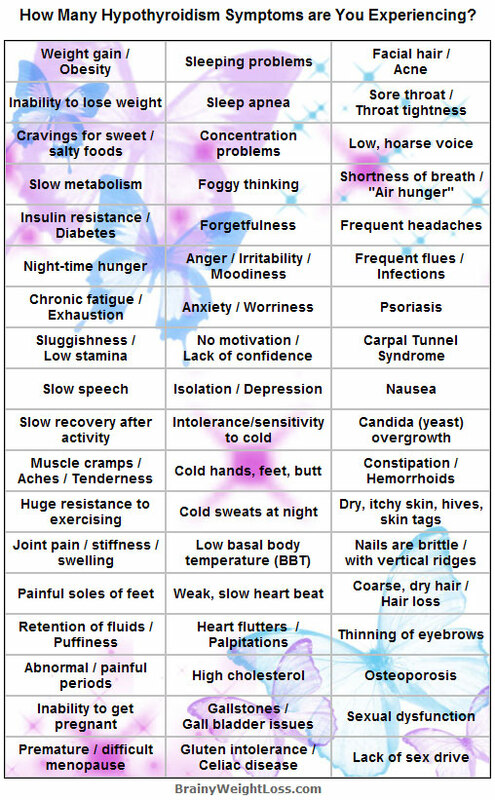 But if you experience some of the hypothyroidism symptoms listed above and want to determine if you really have an underactive thyroid, here’s a simple test you can do on your own. You will be measuring your basal (at rest) body temperature (BBT) during 3-5 consecutive days, immediately upon waking up in the morning, before getting out of bed and becoming physically active. You can do this test on any day of the month, unless you are a menstruating woman, in which case you should do it only on days 2,3,4, and 5 of your period; that’s because your body temperature varies significantly with the menstruating cycle, altering your results. It’s best if you can get an old-fashioned, mercury thermometer (ask for a BBT or a fertility thermometer at your local pharmacy or natural health store), as most digital thermometers aren’t accurate enough for this thyroid testing and you could end up with unreliable results. The night before starting your hypothyroid test re-set the thermometer by shaking it down to get the mercury column go down to 35ºC (95ºF). Place it by your bed so that you can reach it with minimal movement (this is important). The following morning, as soon as you wake up, gently push back your comforter and put the thermometer in your armpit with its tip firmly placed next to your skin, keeping it there for a full 10 minutes. Just relax and stay still before the 10 minutes are up to avoid raising your temperature and compromising your hypothyroid test. Record the exact readings each morning for at least 3 consecutive days so you can average out the results. Considering that the normal body temperature with a healthy thyroid is 36.6ºC – 36.8ºC (97.8ºF – 98.2ºF), the lower your temperature below the 36.6ºC (97.8ºF) mark, the more underactive your thyroid. 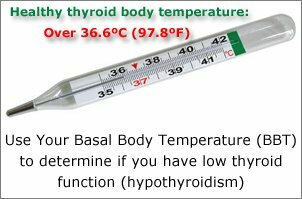 Along with at least other few low thyroid symptoms, your basal body temperature (BBT) test is a pretty accurate and very helpful diagnostic tool for low thyroid levels, although controversial with some medical practitioners. But your inability of losing weight with hypothyroidism cannot be denied; an underactive thyroid requires special attention and you should insist to have a comprehensive blood test done, measuring levels of the thyroid hormones T3, T4 and TSH. If your GP doesn’t cooperate to getting you tested dismissing your low thyroid symptoms with an exasperating “You’re just hoping that thyroid treatment will make you lose weight” or worse, “You should exercise more” move on. Find a good, more “aggressive” endocrinologist willing to test you for hypothyroidism. In the meantime, put an end to your misery by diminishing drastically your debilitating hypothyroidism symptoms with the best diet for hypothyroidism. I encourage you to learn everything you can about hypothyroidism – especially the new research – this is really the very first step to a hypothyroidism-free life. 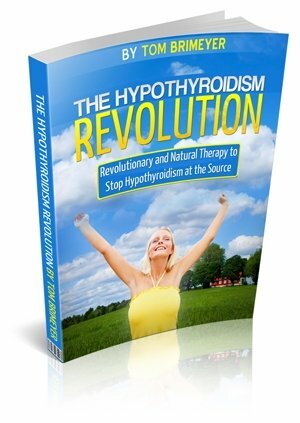 One of the best (and most affordable) resources I can recommend is Tom Brimeyer’s Hypothyroidism Revolution. Tom Brimeyer is a Functional Medicine practitioner and an expert on hormones and nutrition. His Hypothyroidism Revolution is a comprehensive program with a revolutionary, 3-phase approach (hence its name), that shows you not only the thyroid-supressing workouts, foods (and supplements you may be taking) that aggravate your hormonal imbalance; you’ll find out here all you need to know about the root cause of your underactive thyroid, how to reverse your low thyroid levels, why drugs are not always a good idea and what to do instead. You’ll see that no matter how damaged your thyroid is, your body CAN heal. Hypothyroidism Revolution gives you a 60-day step-by-step plan and the tools you need to kick-start your thyroid and get it up to its normal function again: meal plans, recipes, grocery shopping lists, diet calculators and more. You get email coaching too (check to see if this offer is still available). Best of all, you get the info you need to reverse your low thyroid symptoms naturally and practical solutions that don’t have any side effects that you might later regret – like the traditional (and very misleading) “one little pill a day for the rest of your life” mantra... If you’ve seen your doctor regarding your low thyroid symptoms you know what I’m talking about. So don’t miss out on Hypothyroidism Revolution – get the info you need to start now!